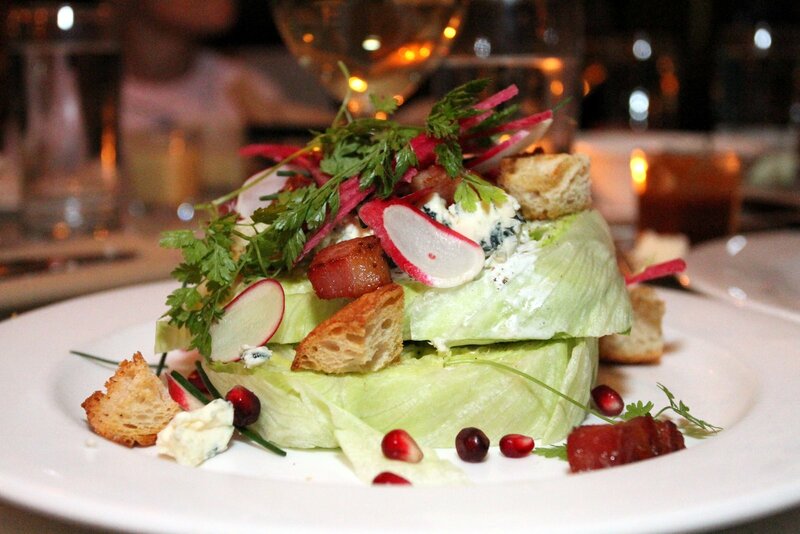 Fish & Farm is a farm-to-table full service upscale restaurant in the downtown/Union Square area of San Francisco. They source most of their meat and produce from within a 100-mile radius. You’ll want to make reservations to dine here. I heard about this restaurant, which is nestled inside of the Mark Twain Hotel, from the 7×7 guide to the best hamburgers in San Francisco that was published on Foodspotting and the 7×7 website. I originally went to San Francisco to attend the Thread fashion show, but I decided to make it a family trip/food adventure with a reservation for 5 at Fish & Farm. When they bring out the burger at Fish & Farm it is stabbed with a knife. 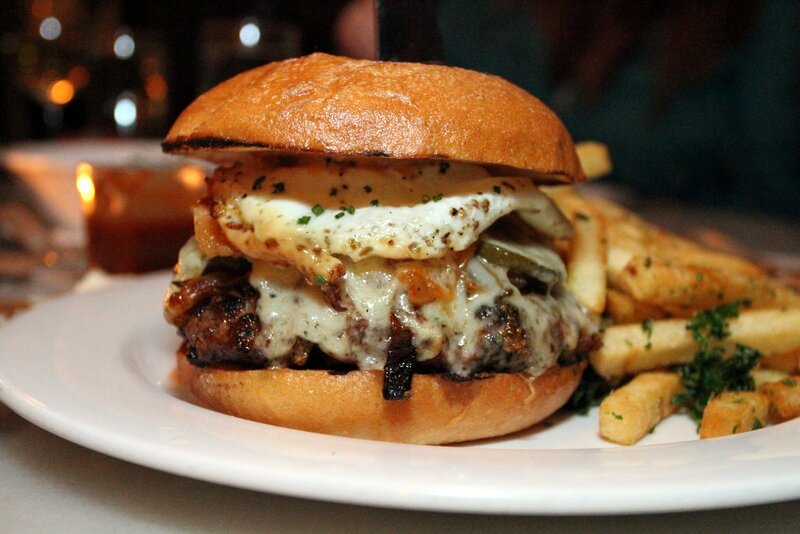 Maybe to signify how fresh the beef is, or maybe to keep this humongous burger together on your plate. Either way, the burger makes for an impressive presentation. On the menu, this burger is described as having “grilled onions, white cheddar, house made pickles, secret sauce with an acme bun”. I added Hobbs bacon and a fried egg because that’s just how I roll. The bun was perfectly toasted and tasted like it was fresh from the bakery. It turns out that the buns are sourced from the Acme Bread company which is only a few miles from the Fish & Farm restaurant. Each bite of this burger was bursting with juiciness and flavor. I wanted to take my time and savor each bite, but the burger was too good to slow play. Luckily, the added bacon and egg made the burger extra filling, so I was almost forced to slow down eating this burger masterpiece. The secret sauce was used sparingly, but you could still taste the unique flavor all the way through the burger. The fresh pickles and grilled onions just added to the overall flavor experience. 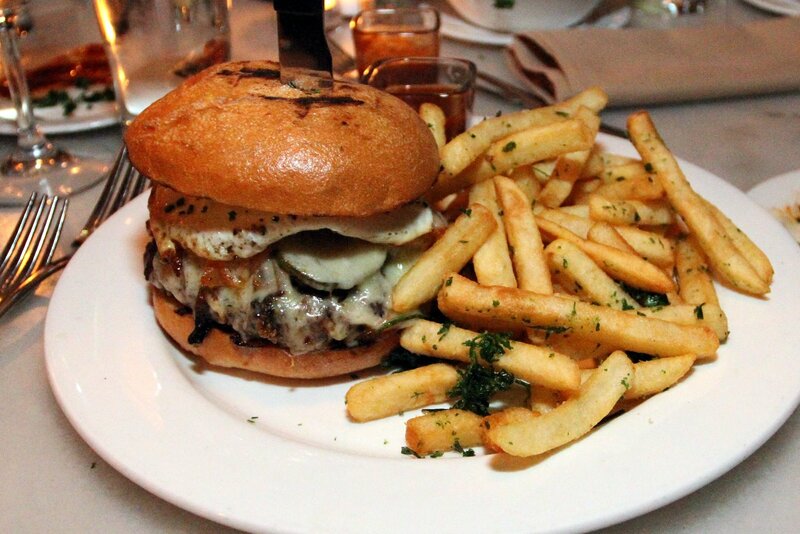 As of the time of this writing, this is my favorite burger I’ve ever eaten. I’ve tried a LOT of burgers, so that’s saying a lot! I could see myself making the 2 hour drive from Sacramento to San Francisco just to have another one of these burgers (or at least coming up with an excuse to visit The City so I could make a planned stop at Fish & Farm). 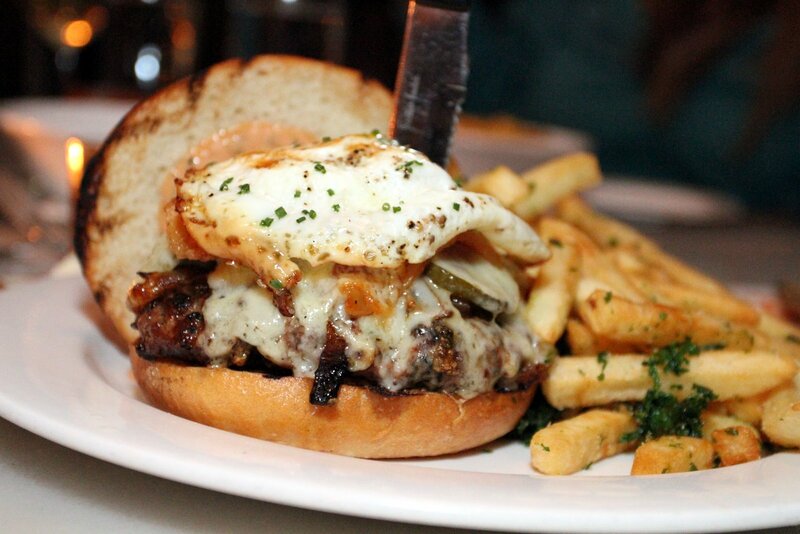 Even at $18 with the added bacon and fried egg, this burger lived up to its price tag.